The reason I love framing is because I love to surround myself with beautiful things, and I know that many of you feel the same way. Beauty is what spices up our lives and inspires our imagination. That is part of the mission at LLB, where we like to feature unique, beautiful artisanal products. 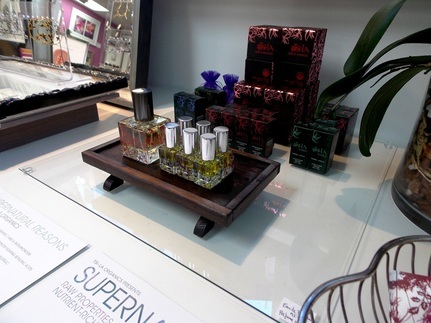 We're excited to welcome Tsi La organic fragrances to our gallery. enhancing your skin’s own mineral content. 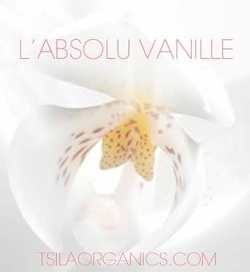 Below is a description of five of our Tsi-La fragrances. All can be blended to combine the benefits of their oils. Enjoy! According to legend, young girls who breathe in the bewitching aroma of tuberose when nighttime falls will be overcome with desire. We've infused these voluptuous white flowers with fresh Tunisian neroli, Italian bergamot, Egyptian jasmine petals and rich blonde woods to create a sultry, natural perfume that offers the promise of dangerous pleasures. Fluer Sauvage is Animal Cruelty Free, Vegan, Free From Harmful Synthetics, Color and Preservative Free, Organic, All Natural Perfume. Smell Good Enough To Eat. Blends well with Ilang Ilang & Kizes . Elegant notes of warm amber and precious rare woods are combined with seductive, smoky incense, a hint of Egyptian jasmine, davana, exotic spices, and fresh lime to create a mysterious, unisex, natural perfume steeped in sensuality. Kesu is Animal Cruelty Free, Vegan, Free From Harmful Synthetics, Color and Preservative Free, Organic, All Natural Perfume. Smell Good Enough To Eat. Blends well with Kizes & Fiori D'Arancio. A delicious sun-kissed blend of Sicilian bergamot and juicy clusters of elderflower blossoms meld with a sensual infusion of voluptuous Indian tuberose, jasmine petals, and the delicate Tunisian orange flower to create a pure, playful, unisex natural perfume. Kizes is Animal Cruelty Free, Vegan, Free From Harmful Synthetics, Color and Preservative Free, Organic, All Natural Perfume. Smell Good Enough To Eat. Blends well with Kesu, Ilang Ilang, Fleur Sauvage, & Saqui. Ilang Ilang is Animal Cruelty Free, Vegan, Free From Harmful Synthetics, Color and Preservative Free, Organic, All Natural Perfume. Smell Good Enough To Eat. Blends well with Kizes & Fleur Sauvage. Sparkling notes of luscious orange blossoms, juicy tangerines, caramelized vanilla, and Tunisian neroli flowers infuse with nourishing extracts to create a sheer and delicate, natural perfume drenched in happiness. Fiori D Arancio is Animal Cruelty Free, Vegan, Free From Harmful Synthetics, Color and Preservative Free, Organic, All Natural Perfume. Smell Good Enough To Eat. Blends well with all Tsi-La fragrances. healing and attracting love. The word perfume comes from per-fumer: Latin meaning “through smoke” and is a reference to its ritual use in ceremonies for the Gods who offer love’s blessings. 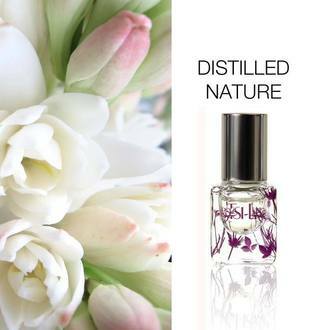 The pure beauty of your flowers can be paired with Tsi-La Organics signature perfumes. “mini-collection” is an ideal bride’s maid gift and can be ordered for you.